"The International DS-500 Diamond Series 500 Watt Type 3 Voltage Converters are 220 Electronics best Voltage Transformers. Able to convert 110 volts to 220 volts and 220 volts to 110 volts and tested to the highest workmanship and material standards, these Type 3 transformers with an extra durable lifetime coil are second to none. Hand soldering techniques provide flawless electrical connections that meet U.S Military specifications. With copper prices on the rise, some companies are adopting a less is more policy, thinking they can create a lighter and more efficient transformer by using less copper. All this offers the consumer is a lower quality product. 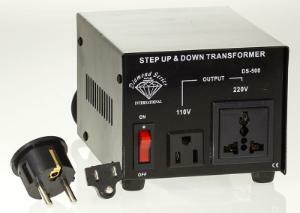 At 220 Electronics we always apply the Golden Rule of Voltage Converters to our transformers. 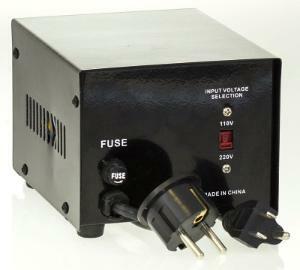 Never use a voltage converter that doesn't have a wattage rating 2 to 3 times higher than the appliance you are using. Two examples of devices that can use this transformer are a window fan and a dehumidifier. If you are visiting or moving overseas any time soon, then purchase one of our highly recommended Diamond Series Voltage Transformers. Recommended for High Value and/or Sensitive Items"